Happy Easter! I'm looking forward to coloring eggs with my kids this year, what are your Easter plans? I'm giving away a $10 Amazon Gift Card here at Book Liaison. Just fill out the Rafflecopter form to enter. Happy Easter and thanks for the giveaway! No kids, no plans. Well, the general idea is to clean, read and watch DVDs. 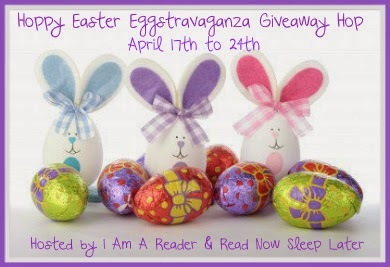 Thank you for the giveaway....I have a few books I want to purchase! I will probably be hiding eggs for my children over and over and over and over and over...You get the picture. Happy Easter! Thank you for doing the giveaway! Hope you and your family have a wonderful Easter. Thanks so much for the giveaway and Happy Easter! Thanks for the giveaway! I hope you have a wonderful Easter. With this gift card, I could get Don't look back, which is one I have been wanting to read. Thanks so much for the giveaway! Hoppy Easter! Happy easter and happy hop!! thank you for the giveaway and all your hard work!! Happy Happy Easter! Hope you get lots of goodies in your basket! Happy Easter and thanks for the chance to win! I'm having a bunch of family over for dinner. Happy Easter. Thanks so much for the chance. Thank you for running the giveaway!!! Happy Easter! Thanks for the giveaway. Happy Easter! Thanks for the chance to win. Thanks for taking the time to participate in the hop. Happy Reading!! I had a nice relaxing Easter with my husband this year. I did take advantage of the nice weather by taking my dog to the park. Thanks for offering this giveaway and the chance to win! I am loving this hop and have found so many wonderful new blogs to follow! Great giveaway. Follow on bloglovin as Patricia Pinkston. Thank you for the giveaway! I hope you had a great Easter. Thanks so much for the amazing giveaway! I hope I win so I can buy a book from my Goodreads list! :) I hope you and yours had a fantastic Easter!